I saved this recipe from a newspaper back at about the turn of this century. Then I made it up 2-3 years ago. At christmas lunch we finally broached a jar. They were about as amazing as I had hoped, and wonderful with the baked glazed ham. Also grand in a toasted ham and cheese sandwich. 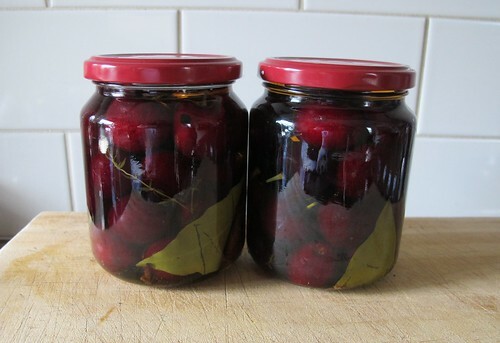 So I’ve just bottled another half kilo before cherry season ends. Bring the vinegar and sugar to boil in a saucepan*. Allow to cool. Use clean, unmarked fruit. Snip the stems of the cherries back to 1cm. Pack into sterilised jars, fill the jars with the cooled vinegar mixture and seal. Leave for 1-2 weeks (I say years) before using. *I misread the recipe this time and included the spices in the boil, never mind, other pickle recipes do this.